Never worry about clearing the snow or ice off your car before you head out again. 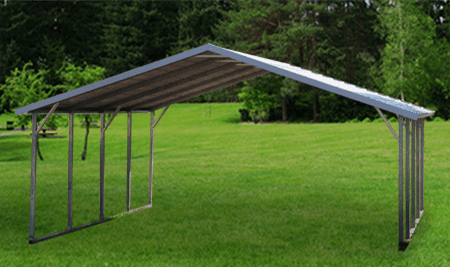 The A-Frame Carport offers a sleek, modern style roof to protect your vehicle from the elements, so you can get in your car and go. It also comes with a variety of features and options, and can fit a full size sedan, truck or minivan. Vertical roof is required on all A-Frames over 30′ wide or 35′ long. Base pricing reflects this requirement.